Penalties raise your golf score. Only 34 basic rules of golf exist but they fill 215 pages in the "USGA Rules of Golf" book. The intent of the rules is to keep the game fair for all players and to deal with unusual situations golfers may encounter, such as hitting the ball outside the boundary of the course. Penalties are assessed if the rules are broken. 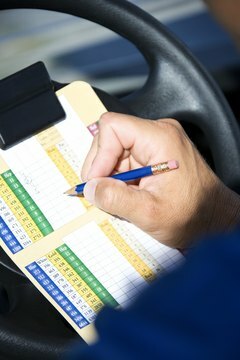 In stroke play, the requisite penalty strokes are added to the player's score for the hole in which the rules violation occurred. Add two strokes to your score for the hole if you ask what club a fellow golfer hit his shot with. Any time the ball moves after you've addressed it -- set the club behind it -- you incur a one-stroke penalty, unless it falls off the tee. Write down a one-stroke penalty if you can't find your ball. You must go back to the spot you originally hit from, take a one-stroke penalty and hit another ball. If the ball lands where it's unplayable you must drop the ball no closer to the hole and take a one-stroke penalty, or go back to where the ball was originally hit, take a one-stroke penalty and hit another ball. Replay the shot if the ball goes out-of-bounds, in other words, if the ball leaves the designated field of play, as indicated by white stakes at the boundary. The shot is replayed from the same spot the original shot was played with a one-stroke penalty. Take a two-stroke penalty if you improve the lie of the ball. Play a ball in the rough without moving any branches or bushes -- or using your body to bend or break any plants -- or it's a two-stroke penalty. Drop the ball incorrectly -- either via a free drop or one taken after a penalty -- then play the ball, and you receive a one-stroke penalty. Mark down two additional strokes if the ball hits you after you've struck it. Hit the pin while you're putting from the surface of the green and it's a two-stroke penalty. That penalty is in force even if the pin is removed from the hole and on the ground when you hit it. Play a ball other than your own and you'll incur a two-stroke penalty. Take a two-stroke penalty if you putt your ball on the green and it hits another ball, also on the green. Replace your ball marker in the wrong spot and it results in a one-stroke penalty. Take a two-stroke penalty if you've addressed the ball to putt and you allow someone to point out the correct putting line. Repair spike marks before you hole out your putt and it's a two-stroke penalty. You are allowed to repair ball marks -- damage caused by a ball striking the green. Don't let someone else shield you from the elements -- such as rain -- when you putt, or it's a two-stroke penalty. Wait more than 10 seconds for the ball to drop in the hole if it's on the lip and it's a one-stroke penalty. Start counting once you've walked up to the cup. Hold the club above the ground in a sand trap or hazard. If it's placed on the ground at any time -- called grounding the club -- it's a two-stroke penalty. Add one stroke to your score if the ball lands in a rain-filled bunker in which there is no place to obtain relief from the water within the trap and the ball is unplayable. Drop the ball outside the bunker. Carry no more than 14 clubs in your bag or you get a two-stroke penalty for every hole played with the extra clubs, with a maximum penalty of four strokes for the round. If You Are Off the Green But Closer to the Hole, Do You Putt First?